Alma landlord Ben Martin and manager Michelle Morris, pleased to be in the Camra Good Beer Guide again and to be runner-up for a Harveys Brewery Silent Customer award. Alma Arms landlord Ben Martin and manager Michelle Morris are celebrating seeing the pub in the Camra Good Beer Guide for the eighth year in a row. They say they are the only Uckfield pub in the guide. He added The Alma was well-known for keeping its bitter well and it was a matter of pride to him to hold on to that reputation. The seasonal ale from October 1 will be The Star of Eastbourne, a customer favourite. 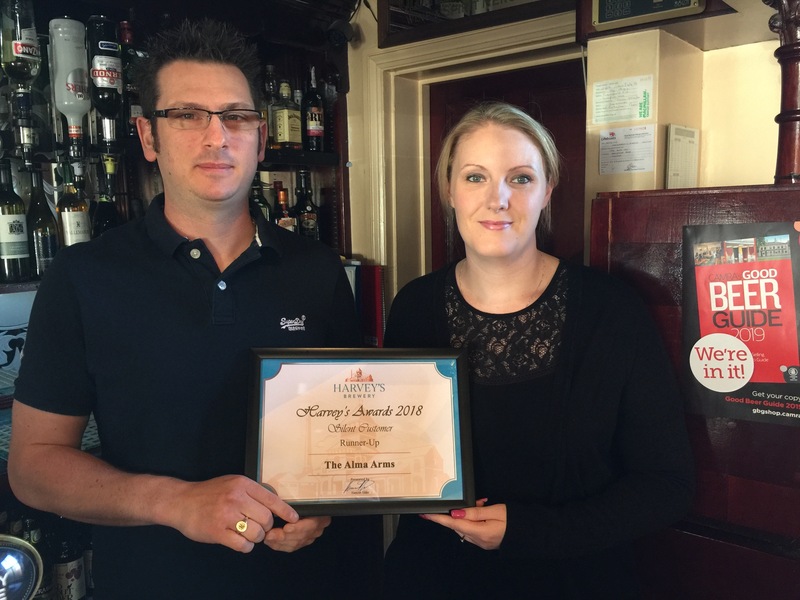 There’s another cause for celebration at The Alma because the pub was chosen as runner-up for a Silent Customer award by Harvey’s Brewery. The pub has launched a new winter menu and announced its Christmas and Christmas Day menus too. You can see all on the Alma website. Pub dates for your diary include Tuesday, December 11, when Uckfield Concert Brass will be playing Christmas Carols, Wednesday, December 19, when the Ashdown Singers will be carol singing there and Monday, December 31, when there will be a New Year’s Eve disco.